It was so much more than expected! Large, comfortable, able to get in early and leave later. Free putters and golf balls and not even an ID required to use them. Very friendly front desk and a great experience. Gorgeous location, very clean, super nice staff, great pool. Beautiful grounds and amazing pools. Rooms were excellent. We didn't stay at the hotel very much even though it was fantastic. Too much to do outside the resort in Kauai. Great views, great pool, and room was everything we needed. The staff was great with things ti do. The room had plenty of space and the grounds were beatutiful. Just kick back, unwind and let the knowledgeable team at Orbitz help you plan an unforgettable Princeville getaway. If you're looking to combine your flight and hotel options to save cash, you're in the right place! If you bundle your bookings, you'll save up to $857*! Simply choose your preferred airfares, hotels, rental cars and experiences. You've got more than 500,000 accommodations globally and 500 partner airlines to choose from. With such great flexibility, crafting a perfect getaway is a breeze. There are limitless options to tailor your own remarkable vacation, no matter your style, budget or needs. Life's not much fun without little perks and extra savings. You'll collect instant Orbucks if you keep booking with us. This simple program lets you gain rewards quicker than anyone else. Redeem your Orbitz Rewards points on your next booking. If you secure four nights in a full year, you'll be a gold member; 12 nights means platinum membership. Special perks, like complimentary breakfast, at Orbitz Rewards VIP Hotels are available for all gold and platinum customers. Princeville — you've heard plenty about the place, you're longing to get there but don't have any idea where it is? Let us point you in the right direction. You'll discover it approximately 120 miles northwest of Honolulu, the state capital of Hawaii, and around 18 miles northwest of Lihue. This area of Kauai is home to around 2,000 people. 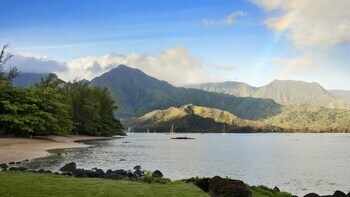 In Princeville you'll discover a range of worthwhile tourist sights, like Hanalei Bay and the Princeville Golf Course. Make sure you swing by all of them! Beachcombing is a fun activity the entire family can get into. Why not take the kids to Anini Beach to see what you can spy washed up on the seashore? Want some more options? Walk down Hanalei Pier, which is especially magnificent right at sunset. But wait, that's not all! Feel the wind in your hair, the water lapping at your feet and the salt in the air at Puupoa Beach. Take your love of travel to new heights by checking out car rentals in Princeville. No matter where you go or what you're wanting to do, Orbitz will help you find a rental that satisfies your adventurous spirit. Head out of Lihue Airport as soon as you land by renting a vehicle from an office right near the terminal. You won't need to go very far to find Avis and Payless. If you're staying around the city, head to Avis at 5-3541 Kuhio Hwy, Airport Administration Bldg. It is located a short 2 miles from the town center. Orbitz will help you choose the best place to sleep in this great destination. Currently, we have 57 hotels in Princeville. When you're arranging your island getaway, look into the facilities and deals at The St. Regis Princeville Resort and The Westin Princeville Ocean Resort Villas. All you need to do is decide between them! Hoping to jump on a plane to Princeville? If so, you should know a few things about the most convenient airport, Lihue Airport (LIH). It's positioned 18 miles to the southeast of the downtown area. Get set to touch down and start your sightseeing soon after! If you've seen the best of Princeville already, don't fret. You've actually got internationally famed tourist attractions right on your doorstep! Waimea Canyon draws travelers from all nations. Kekaha, only 20 miles from Princeville, is a convenient base when stopping by this world-famous attraction. It goes without saying that plans can change in the blink of an eye, which is why we won't charge a fee if you have to revise or cancel your booking.^ However, it's a good idea to see if your chosen airline and hotel have a similar policy. Beautiful Newly Renovated Condo in Paradise! Hale Loli'i "B" - Perfect to Explore our North Shore Splendor? Hanalei Bay Resort #9305: Ocean Front Views With AC & Loft! 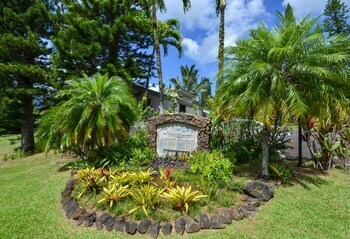 Kapiolani Villa: Ocean Views and Private Pool With AC! Hanalei Bay Resort #3201 & 3202 - Great Ocean Views AND AC! Pali Ke Kua 119-air-conditioned, Private, Corner Condo With Amazing Ocean Facing Windows! Visit Bali Hai Villas, Your Island Getaway!